Dallas Chocolate Festival Speed Dating: Where specialty retail buyers and chocolate artisans look for the perfect relationship… one 5 minute “date” at a time. Are you in search of the perfect chocolate for your shop? Come to our speed dating event to learn about chocolate retail curation where you can meet some of the best chocolate artisans in the world… all in under 2 hours. Learn something useful and make new business connections that will help your business grow. Parking: Parking is available in the Ross Tower parking garage. (see map below). Yelena Caputo from A Priori Specialty Foods will give a presentation on how to tailor your chocolate offering for the customers that come into your shop. Topics include product selection, display, and how and when to sample. Spend 5 minutes at a time with retail-ready chocolate artisans who are participating in the Dallas Chocolate Festival. Taste their products, learn their stories, see if you get the warm fuzzies of a new love… and then move on to the next one. Upon conclusion of Speed Dating, participating retailers are welcome to enjoy the day’s events at the Dallas Chocolate Festival in the main exhibit hall at the F.I.G. courtesy of the Dallas Chocolate Festival. Event parking will be available in the Ross Tower Parking Garage. …let’s just say you might want to skip breakfast. Check out the D Magazine recap of the 2017 festival and see what it’s all about. 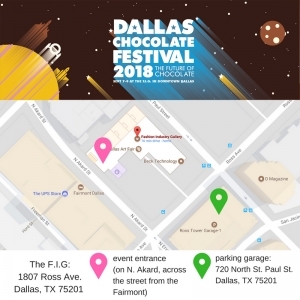 We hope you join us in celebrating all things chocolate in the heart of Dallas’ Arts District at the F.I.G. (Fashion Industry Gallery). Make sure to join our mailing list using the form in the footer to get up-to-date on ticket sales, event announcements, and all the news in Dallas Chocolate!